The problem is that we think we want equality in places where we actually want equilibrium. 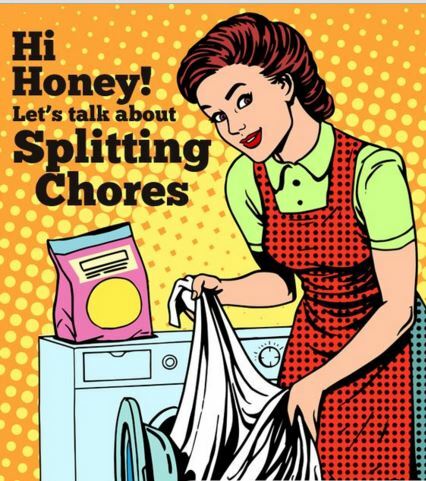 The great debate about the division of household chores stands in stark synchronicity with a baseless gender strife. There are multiple variables to consider when we discuss that but people always end up narrowing it down to a trifle example of what happens in an individualistic family. That, although may be a way to look at things in general but it is not the right thing to do. But right or wrong, there is one thing absolutely certain here- That we cannot afford to let this plethora of complex problems pass on the future generations with as many complications to consider as we do now. People tend to write either from experience or from frustrations when they talk about sharing the load in houses. Let myself be no exception here. But the difference is that I look into this issue with a more optimistic lens than what the statistics have to say. Which statistics you ask? 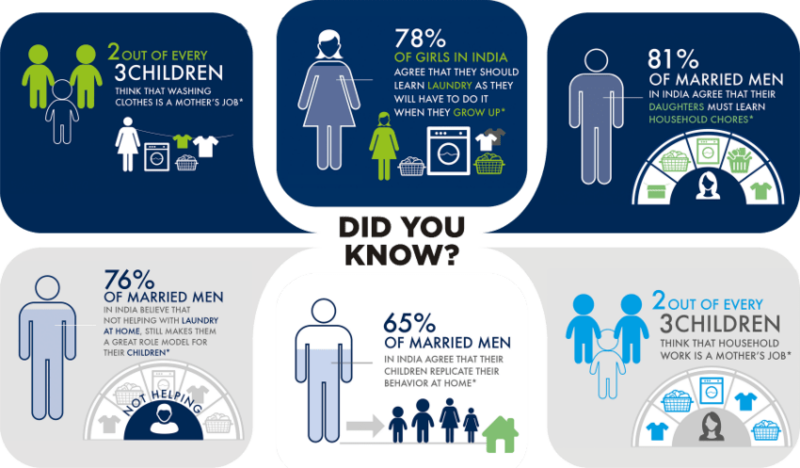 Well these statistics which hint towards an idea of how children look at the notion of division of labour and whether or not they are motivated enough to take up more supportive roles in their own responsibilities in future households. Before starting to unravel the repercussions that these notions may have on the way the future generations turn up, let me tell you how I perceive this in an immediate context of my own family. Surely like many Indian families of my times, my mother has been the one who has had to bear with all the household chores. She is the one who has taken up the responsibility for the food on the table, the clothes in our almirahs and keeping our house more homelike. She is a home-maker and we love her for that. Not only this, we respect her for that. Just as we respect how my father has been the breadwinner in his own work domain. It is not to say that these so called ‘work-domains’ are where they should belong but that they have chosen to take them up so as to strike that balance, that equilibrium in the household. But never have they ever made it a point that we children have to necessarily take up the exact similar roles in our lives. They have taught us that we are required to support out better halves in every way possible in order to strike the equilibrium in the new world that is coming up out there. And this knowledge they have passed on from their own parents. My grandmother and grandfather had always seen to it that their boys also learn the set of skills that they wanted their daughters to possess. Whether or not they may need them is another thing but they should always be prepared for it. And this is how the teaching has evolved when it has been passed on to us by our parents. My parents have separate work domains but they never shy away from helping each other out when they need to. Along similar lines, I look forward to supporting my spouse in future and to getting a similar support from her in working out things for each other. Maybe it is easier to talk like this than to actually do them but this is where the optimistic lens really comes in. I believe that we will work it out, somehow; that we will strike that perfect balance in spite of the criss-crossed work-domains that we may have in our lives. And this belief is not founded merely on positive thinking but on multiple examples of families that I see in my life. I have observed that whenever people are citing these imbalances through a dramatic portrayal of sorts, the background of it is mostly the Indian metros that have recently been flooded with myriads of young couples. But amidst the chaos, I see resolution. I see how those young people, those upcoming generations have taken up these challenges and made small work of them. Yes, they may have been subjected to some of the stereotypical gender identities in their own childhoods but they have learnt some good lessons out of them. If these cities are a true mirror of our future, then I don’t feel things are as grim as people tend to make them. Only thing is that couples should start coming up more and more with their true feelings in regard to these things. Nothing would come out of wives writing complains over blogs and husbands mocking their wives in bars. There has to be that good, honest conversation between the duo. After all, the load isn’t just the chores. The husband needs to make her understand his deepest troubles and ask her to help him out of them. The wife needs to make him understand the little things she wants from him instead of expecting him to figure them out himself. And when the duo has settled upon those things, they need to pass them on to their children. They need to prepare their children, whether they may be living in a metro or in a small town, for the next step in this evolutionary ladder. It is imperative to keep the future generations away from the prejudices of the age old traditions not because they are harmful in any way but because they misplace a rung in this evolutionary ladder and stagnate the process. And this process should not stop if we really want a better world for our future generations. There are small ways in which we can contribute towards sharing the load and setting examples for the #GenNext. For couples with predefined and separate work domains, the one earning financially can at times take up the task of helping out the home-maker in small chores. These are not big things really and we need to understand here that it takes small gestures of simply showing that ‘you care’ for your spouse and respect what they do. The home-maker can in turn help the breadwinner by carefully managing the finances of the family and saving up those tiny bits for a rainy-day. When the children see this harmony and are taught likewise to bring the same up in future, their minds are filled with hope rather than cheap pessimistic debates over the issue. Similarly, in familes where the work domains are juxtaposed, it is imperative that men, despite the orthodox world-view help out their spouses by sharing the work hours with them. Be it attending to the baby, doing laundry or cooking food, if the wife is doing that in spite of her office work, they should do it too so as to set the right standards for the children. I use ‘if’ here because it holds a great significance here. In the mad race of household ‘equality’ rather than ‘equilibrium’, it is sometimes seen that a different problem has been cropping up. Not only are boys not being made to learn the household chores, the girls of the Gen-Y are themselves uninterested and unattended in being taught the secrets of the trade. This is an even more dangerous issue and one that needs to be addressed with an even more immediate effect. We cannot go on to teach our children to completely neglect the duties of the house in order to excel upon the duties of the office. The beam balance should come to scale; not the weights taken away to do that. It would be a hollow world if we were to teach our future generations this hollowness. We want them to reach perfection in life and not negligence. At the end of the day, life is really about those small things that make a big difference. It may consist of chores and pressures and tensions and exertions, but it is not all about it. Life is about nurturing the present and taking care of the future. And that is precisely what we must do here. hi..did u received the winning voucher?